I just can’t get away from smoothies for breakfast, I’m addicted! They’re simple, nutrient dense and fast, perfect for my rushed work mornings. I keep thinking oatmeal, cereal, or something different would be nice on weekends to mix things up, but always end up going with a comforting, veggie packed smoothie. So I’ve been trying smoothies in different formats and this morning I experimented with chia seed smoothie pudding. I made a smoothie as usual with sprouts, Spirulina, strawberries, carrot, kale and Sun Warrior protein powder. I added a little vanilla and stevia for flavoring. Then I poured it into a bowl and added a tablespoon of chia seeds, stirred and let sit for 15 minutes to thicken. The result was a thicker smoothie soup/pudding and not bad at all. I need to play with the smoothie to chia seed ratio, but I’m liking this as another smoothie-based breakfast option. Anyone who’s ever had traditional, dairy-based Alfredo sauce has probably liked it. And why not when it’s essentially cream, butter and cheese? Mix that with regular pasta and it’s a tasty, gooey dish that’s calorie-dense. But also lacking in nutrients and protein for all those calories. One thing I love about raw vegan recipes is remixing a lot of traditional, not-so-healthy recipes to very nutrient-dense veggie-based version that many times taste better with fresh ingredients. 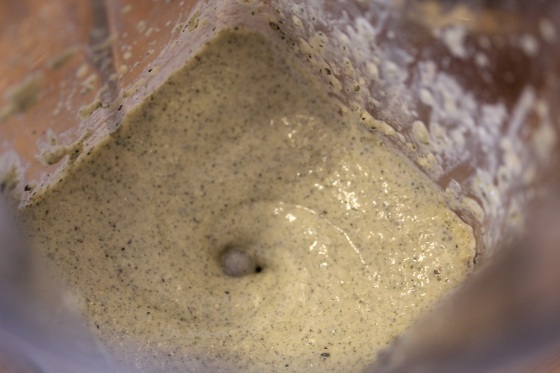 After my stress-loaded week at work, I was craving creamy comfort food and decided to try a hemp seed-based Alfredo sauce. Add all ingredients except parsley and green onions into a blender and blend until smooth and creamy. 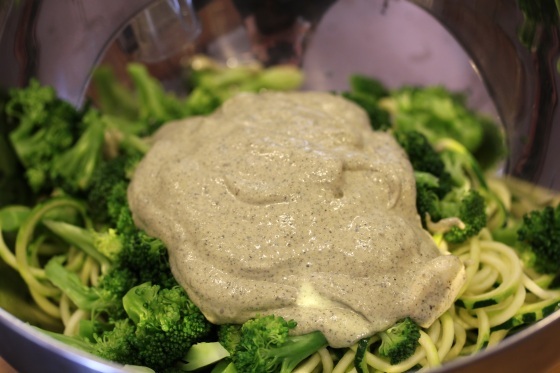 Stir in parsley and onions and mix sauce with zucchini noodles, broccoli, cauliflower or desired veggie combo. Makes about 4 servings. The sauce is very thick and gooey, much like traditional Alfredo. 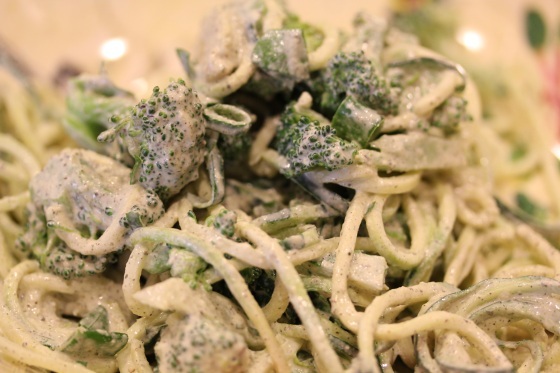 I served it over lightly steamed broccoli and raw, spiralized zucchini. I added two cloves of garlic because I’m a fan of strong garlic flavor, but just one will do if you’re not as huge of a fan. The fresh chopped parsley really added to the flavor for me, I’m becoming obsessed with fresh parsley lately discovering how much better it tastes in recipes over dried. The sauce coated the veggies wonderfully distributing the strong, rich and creamy flavor. If you like regular Alfredo, give this cool, lighter raw version a try. 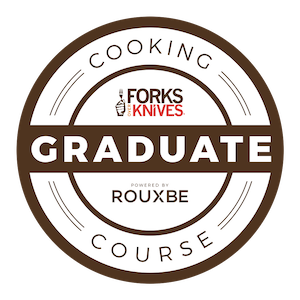 What comfort food should I try to raw-ize next? That dish looks so nice. What do you think you could use as a substitute for the hemp seeds other than cashew nuts? Hmmm, macadamia nuts if you want the sauce to be very rich or pressed tofu cubes for it to be on the lighter side. 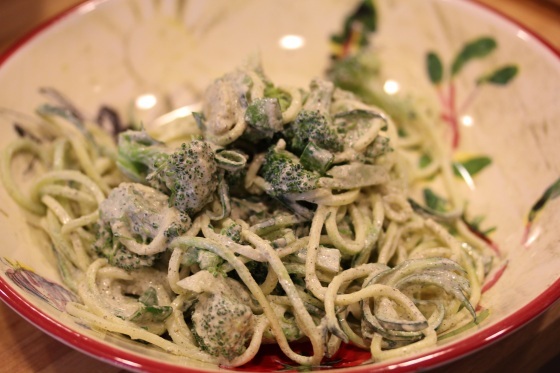 That raw alfredo sauce looks really good on the broc and zucchini spirals! Thanks and the PB&J idea sounds great and a great excuse to try a new raw bread recipe. “And why not when it’s essentially cream, butter and cheese? “– I mean really, let’s face facts…those things usually do make things taste pretty darn good. I know some ppl shun dairy and dont like it, but I have never met two sticks of butter with sugar that didnt make for some great cookies…haha! Great job on the vegan eats, as usual! True on dairy, but I really don’t miss dairy-based cream sauces … either because it’s been so long or there are just to many great raw alternatives. I just can’t fall in love with chia seeds. I tried one of those overnight oats dishes and yuck! I do like them in raw crackers. Your alfredo looks divine. 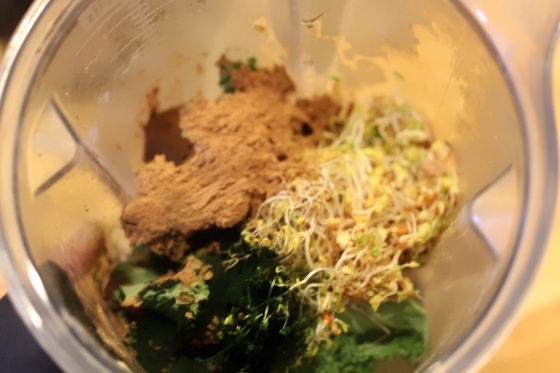 Yet another fabulous Raw Project recipe that’s bookmarked! 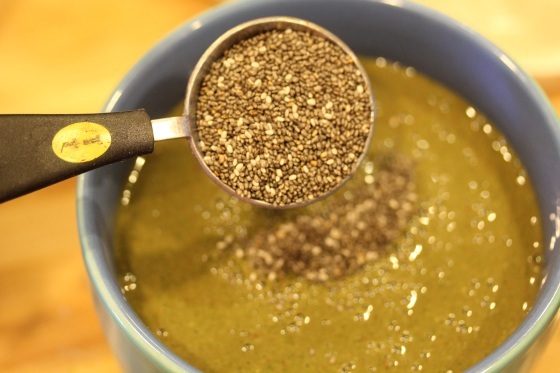 I adore chia seed pudding and don’t mind them blended into a smoothie, but by themselves they don’t have that great of a flavor. Ooh la la! I need some recipes for getting rid of my hemp seeds. Quick question! I mistakingly got the unshelled kind. They are edible, just crunchier. Would they work in this recipe, or add a weird flavor? I actually don’t think pastured butter and cream are bad for you (they have some interesting vitamin profiles)…but a lot of stuff in the supermarket is such garbage. When I’m at school and can’t get a hold of the good stuff (and thus choose to go without), these kinds of nutrient-dense recipes are a life-saver. 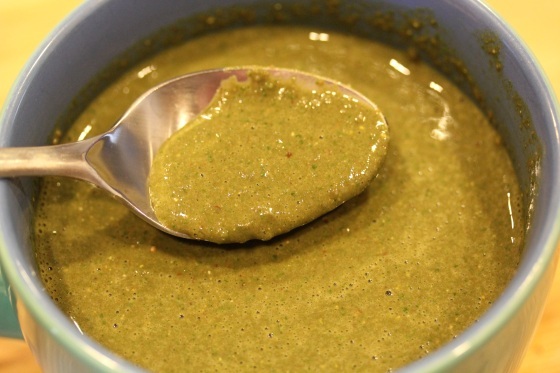 Or just a great any-time recipe for when my meals need a shakeup! Sorry for the delayed response, it’s been a mind-frying week! For the non-shelled seeds, I’d just blend then in creamy sauce recipes or smoothies, the blender should be able to take care of the shell. But they may be too crunchy for eating straight up. Agreed on over-processed dairy, it’s just hard to find the good, more ethical stuff and much more pricey when you do. you are the queen of dressings and sauces! ahhh this looks fantastic!!! could I sub flax or chia? I still haven’t purchased hemp yet! im slackin! I do love smoothies, but it’s not been warm enough here to really craving them. I’m looking forward to trying some of the recipes I’ve seen floating about with raw oats in them! This sauce is amazing! I tried it over some steamed broccoli, cauli, and peas. Super delicious! Is there a way to sub hemp seeds? My family does not feel comfortable with me consuming any hemp related foods.. and I don’t want to stir commotion. So I decided I’ll just use a substitute for now. I’m trying to make veggie patties and the recipe calls for flax and hemp seeds, and I’ve been searching all over the net for a hemp substitute. So far no luck. I have considered chia seeds, oats or even nutritional yeast, but not sure.. Any tips would be greatly appreciated. Thanks! Hi Penny, you could use cashews or sunflower seeds in place of the hemp seeds. Chia and flax seeds would probably be too gooey and gelatinous.